Fruitland Irrigation company flume under construction. Colville River at Meyers Falls to orchards, just above Colville River. 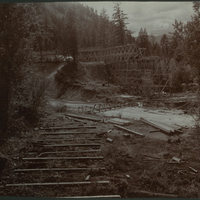 “Fruitland Irrigation Ditch under construction,” Crossroads Archive, accessed April 20, 2019, http://crossroadsarchive.net/items/show/3225.